The American Thoracic Society defines asthma as a “disease characterized by an increased responsiveness of the trachea and bronchi to various stimuli and manifested by a widespread narrowing of the airways that changes in severity either spontaneously or as a result of treatment.” Status asthmaticus can be defined as a severe continuous bronchospasm. Asthma is a clinical syndrome characterized by variable airflow obstruction, increased resonsiveness of the airway to constriction induced by nonspecific inhaled stimulii (airway hyperresponsiveness), and cellular inflammation. This airway inflammation and injury, as well as structural changes in the airways in some patients, are essential components of asthma. The host environmental factors that allow the airways of patients with asthma to be susceptible to these processes, either with the initiation of the disease or its persistence, have yet to be fully established. However, the initiation of asthma can occur through interaction with a variety of factors, including allergens, airborne irritants, respiratory viral infections, and occupational exposure, each of which likely acts through different pathways to produce the same result, airway inflammation, airway hyperresponsiveness (AHR), and airflow obstruction. 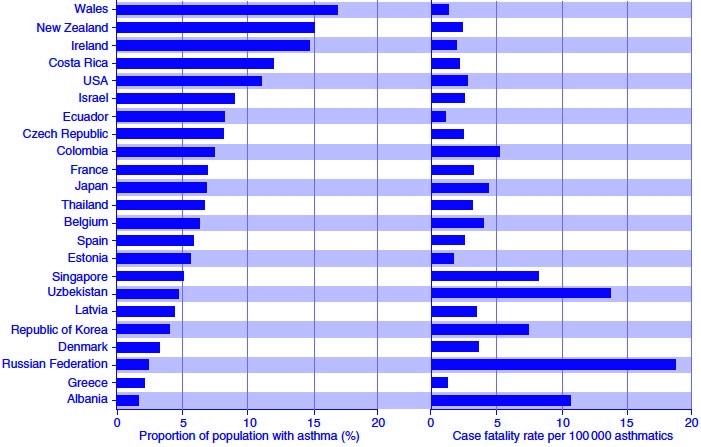 Figure 11 The prevalence of childhood asthma in a range of countries, including those with the highest prevalence (>15%) and those with the lowest (<3%). • Asthma affects 5% of the population. • It is more common in children (10% of children, 5% of adults). • 50% to 80% of children with asthma develop symptoms before 5 yr of age. • Overall asthma mortality in the U.S. is 20 per 1 million persons. • Use of accessory respiratory muscles. • Pulsus paradoxus (inspiratory decline in systolic blood pressure >10 mm Hg). • Wheezing: absence of wheezing (silent chest) or decreased wheezing can indicate worsening obstruction. • Mental status changes: generally secondary to hypoxia and hypercapnia and constitute an indication for urgent intubation. • Paradoxic abdominal and diaphragmatic movement on inspiration (detected by palpation over the upper part of the abdomen in a semirecumbent position): important sign of impending respiratory crisis, indicates diaphragmatic fatigue. 1. Pulsus paradoxus >18 mm Hg. 2. Respiratory rate >30 breaths/min. 3. Tachycardia with heart rate >120 beats/min. Figure 11.1 World map showing direction of change in prevalence of asthma symptoms for 6- to 7-year age group and 13- to 14-year age group. Each symbol represents a center. Blue triangle, prevalence reduced by >1 SE per year; green square, little change (<1 SE); red triangle, prevalence increased by >1 SE per year. • Intrinsic asthma: occurs in patients who have no history of allergies; may be triggered by upper respiratory infections or psychologic stress. • Extrinsic asthma (allergic asthma): brought on by exposure to allergens (e.g., dust mites, cat allergen, industrial chemicals). •Exercise-induced asthma: seen most frequently in adolescents; manifests with bronchospasm following initiation of exercise and improves with discontinuation of exercise. 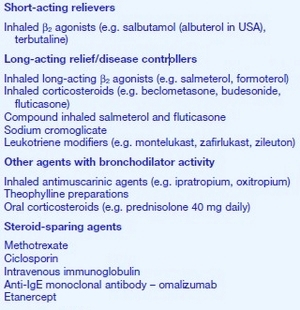 • Drug-induced asthma: often associated with use of NSAIDs, b-blockers, sulfites, certain foods and beverages. • There is a strong association of the ADAM 33 gene with asthma and bronchial hyperresponsiveness. Medical history, physical examination, pulmonary function studies and peak flow meter determination, blood gas analysis and oximetry (during acute bronchospasm), chest radiography if infection is suspected. Figure 11.2 Schematic representation of the likely mechanisms of allergen-induced airway hyperresponsiveness. • CBC, leukocytosis with “left shift” may indicate the existence of bacterial infection. • Sputum: eosinophils, Charcot-Leyden crystals; PMNs, and bacteria may be found on Gram stain in patients with pneumonia. • Avoidance of triggering factors (e.g., salicylates, sulfites). • Encouragement of regular exercise (e.g., swimming). • Patient education regarding warning signs of an attack and proper use of medications (e.g., correct use of inhalers). STEP 1 (MILD INTERMITTENT ASTHMA): No daily medications are needed. STEP 2 (MILD PERSISTENT ASTHMA): Daily treatment may be needed. • Low-dose inhaled corticosteroid (e.g., beclomethasone [Beclovent, Vanceril], flunisolide [AeroBid], triamcinolone [Azmacort]) can be used. • Cromolyn (Intal) or nedocromil (Tilade) can also be used. • Additional considerations for long-term control are the use of leukotriene receptor antagonists-montelukast (Singulair) or safirlukast (Accolade). • Quick relief of asthma can be achieved with short-acting inhaled b2 -agonists. STEP 3 (MODERATE PERSISTENT ASTHMA): Daily medication is recommended. • Low-dose or medium-dose inhaled corticosteroids plus long-acting inhaled b2 -agonist (salmeterol [Serevent]), or long-acting oral b2 agonists (e.g., albuterol, sustained-release tablets). Salmeterol is also available as a dry powder inhaler (Discus) that does not require a spacer device; the dosage is one puff bid. A salmeterol-fluticasone combination for the Discus inhaler (Advair) is now available and simplifies therapy for patients with asthma. It generally should be reserved for patients with at least moderately severe asthma not controlled by an inhaled corticosteroid alone. • Use short-acting inhaled b-agonists on a prn basis for quick relief. Fig. 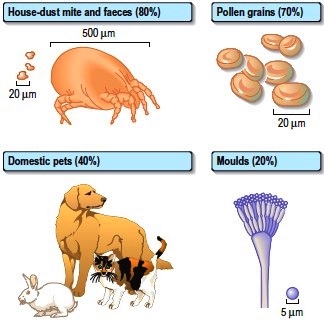 11.3 Common allergens causing allergic rhinitis and asthma. Fig. 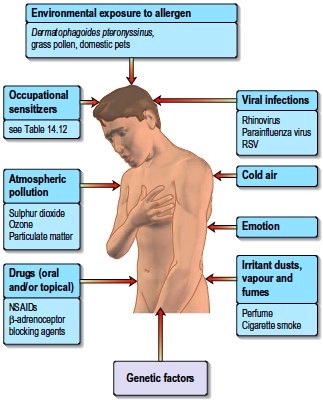 11.4 Causes and triggers of asthma. RSV, respiratory syncytial virus; NSAIDs, non-steroidal antiinflammatory drugs. • Daily treatment with high-dose inhaled corticosteroids plus long-acting inhaled b-agonists (e.g., long-acting oral b2 -agonist plus long-term systemic corticosteroids (e.g., methylprednisolone, prednisolone, prednisone) can be used. • Short-acting b2 -agonists can be used on a prn basis for quick relief. • Oxygen generally started at 2 to 4 L/min via nasal cannula or Venti-Mask at 40% Fio2 ; further adjustments are made according to the ABGs. • Sympathomimetics: various agents and modalities are available. a. Dosage range is 0.3 to 0.5 ml SC; may repeat after 15 to 20 min. b. Onset of action is within 15 min. c. Duration is 1 to 4 hr. d. Use with caution in patients >40 yr or anyone with heart disease. a. 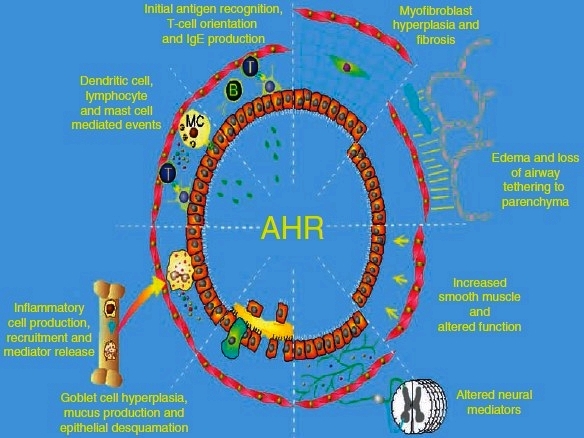 May be given SC, 0.25 mg q6-8h. b. Clinically significant increase in FEV1 occurs within 15 min and persists 90 min to 4 hr. c. Generally, has fewer cardiac stimulating effects than epinephrine; however, systemic vasodilation with compensatory tachycardia can occur. a. May be administered via aerosol nebulizer, bulb nebulizer, or IPPB (e.g., 0.3 ml of metaproterenol in 3 ml of saline solution, given via nebulizer). b. Onset of action is within 5 min; duration is 3 to 4 hr. 4. Isotharine (Bronkosol): 0.25 to 0.5 ml in 3 ml of saline solution via nebulizer q4h is also effective; however, its duration is less than that of metaproterenol. 5. Albuterol (Proventil, Ventolin): 0.5 to 1 ml (2.5 to 5 mg) in 3 ml of saline solution tid or qid via nebulizer. 1. Early administration is advised, particularly in patients using steroids at home. 2. Patients may be started on hydrocortisone (Solu-Cortef) 2.5 to 4 mg/kg or methylprednisolone (Solu-Medrol) 0.5 to 1 mg/kg IV loading dose, then q6h prn; higher doses may be necessary in selected patients (particularly those receiving steroids at home); steroids given by inhalation (e.g., beclomethasone 2 inhalations qid, maximum 20 inhalations/day) are also useful for controlling bronchospasm and tapering oral steroids and should be used in all patients with severe asthma. 3. Rapid but judicious tapering of corticosteroids will eliminate serious steroid toxicity; long-term low-dose methotrexate may be an effective means of reducing the systemic corticosteroid requirement in some patients with severe refractory asthma. 4. The most common errors regarding steroid therapy in acute bronchospasms are the use of “too little, too late” and too rapid tapering with return of bronchospasm. • Atropine analog (e.g., ipratropium bromide [Atrovent] 2 inhalations qid, maximum 12 inhalations in 24 hr) is useful in patients not responding well to or unable to tolerate b-agonists and whose bronchospasm is secondary to bronchitis; when ipratropium is used with a b2 -agonist there is additive effect. 1. Its role in acute exacerbation of asthma has been questioned; IV theophylline or aminophylline has been used in patients with asthma because of its primary bronchodilating effect and its antiinflammatory actions. However, most studies indicate that in patients with acute asthma, the addition of IV aminophylline to b2 -agonists does not lead to additional bronchodilation and may result in significant adverse effects. 2. Most authorities now believe that aminophylline should not be used routinely in the treatment of acute exacerbations of asthma. The addition of aminophylline may be justified only for those few patients who do not respond to b-agonists, corticosteroids, and anticholinergic medications. Aminophylline has potential toxic effects (e.g., cardiac arrhythmias, seizures). 3. When used, frequent monitoring of blood levels is indicated to prevent toxicity, particularly in elderly patients. • IV hydration: judicious use is necessary to avoid CHF in elderly patients. • IV antibiotics are indicated when there is suspicion of bacterial infection (e.g., infiltrate on chest x-ray, fever, or leukocytosis). • Intubation and mechanical ventilation are indicated when above measures fail to produce significant improvement. • General anesthesia: halothane may reverse bronchospasm in a severe asthmatic who cannot be ventilated adequately by mechanical means. • IV magnesium sulfate supplementation in children with low or borderline-low magnesium levels may improve acute bronchospasm. Several reports in recent literature point to the beneficial effect on bronchospasm with a 20-min infusion of 40 mg/kg, up to a maximum of 2 g of magnesium sulfate in patients with acute asthma attack. Fig 11.6 The stepwise management of asthma.